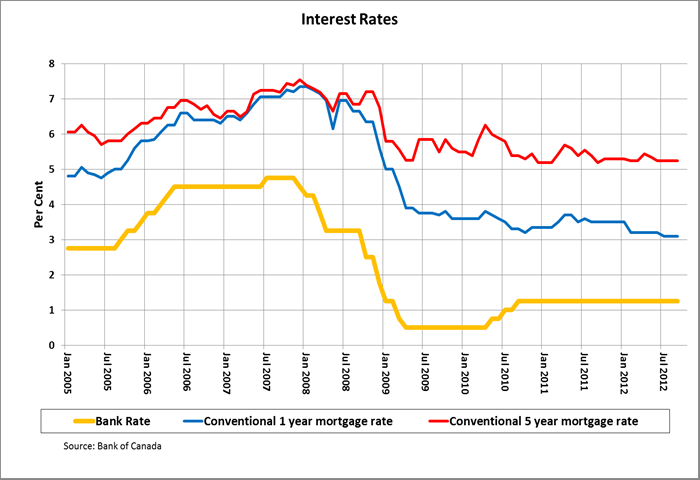 The Bank of Canada kept its key policy rate at 1 per cent on September 5th, 2012, where it has been held steady for the last two years. This marks the longest period since the 1950s that rates have been left unchanged. GREAT news for anyone still looking to get into this amazing real estate market. It's STILL a good time to buy your first house, second home, 8th house, investment property, a rental for your kids in college.. everything! The text accompanying the announcement was little changed from the July statement. This includes the bottom line that the Bank would still like its next move to be a rate hike, but that the timing and degree and any such decision would depend on whether global and domestic trends play out as expected in the months ahead. Although the Bank expects the economic outlook to brighten, it identified a number of downside risks that may force it to lower its expectations. Among these risks are “widespread slowing of activity across advanced and emerging economies,” recognition that “Europe is in recession and its crisis, while contained, remains acute.” It also reiterated that economic growth in China and other emerging economies is braking a little bit harder than it had previously expected. It also noted that economic growth in the United States was continuing at a “gradual pace”. While these factors are consistent with the continuation of low inflation and low interest rates, it also recognized that prices for oil and many other commodities that Canada exports have increased from lower levels this summer. While that means prices at the gas pump have prevented consumer price inflation from edging lower, it also leaves less money in household budgets for discretionary spending, thereby keeping spending and growth in check. Spurred on by the continuation of near-record low interest rates, consumption and business investment are expected to be the primary drivers of growth next year. That said, while business investment remains solid, the Bank acknowledged “tentative signs of slowing in household spending, although the household debt burden continues to rise.” This suggests that the Bank remains worried about growth in consumer debt, even while growth in household debt has slowed to a crawl. The Bank said that core inflation had been softer than expected in recent months, but added that with the economy operating near its production potential, both core and total CPI inflation were expected to return to their two per cent targets over the next 12 months. The bottom line was unchanged for a fourth time since the April announcement, in saying that “some modest withdrawal of the present considerable monetary policy stimulus may become appropriate” based on how global and domestic trends, and risks, play out in the months ahead. So even as the global economic picture continues to dim, and other major central banks talk of renewed stimulus, the Bank of Canada still feels its next move should be a rate hike. Financial markets are currently pricing in the possibility of quarter point interest rate hike next April, but a lot can change between then and now. As of September 5th 2012, the advertised five-year lending rate stood at 5.24 per cent. It has been unchanged at this level since the beginning of June. The Bank will make its next scheduled rate announcement on October 23rd, 2012.